PC FL9 5046, wearing the NY Metropolitan Transit Authority-inspired blue and yellow paint scheme rests after a run into the massive Grand Central Terminal. Photo by Harv Kahn. 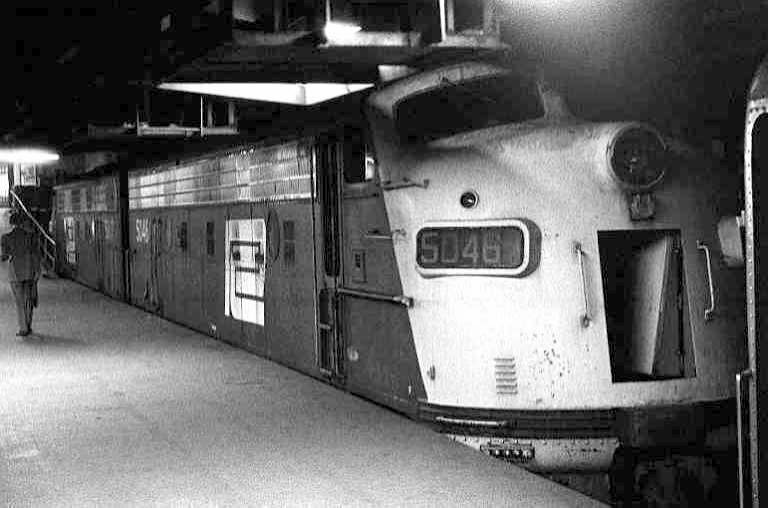 The class unit of the FL9 fleet, the 5000, waits with a train in Grand Central Terminal in December 1976. Photo by Gary Stuebben. 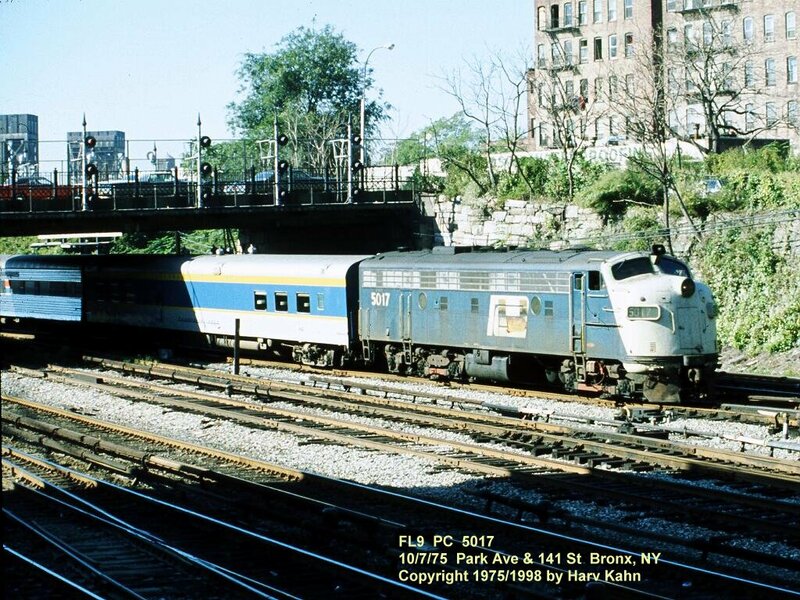 Also in December 1976 at Grand Central Terminal was FL9 5058, the second to last built for the New Haven. Photo by Gary Stuebben. 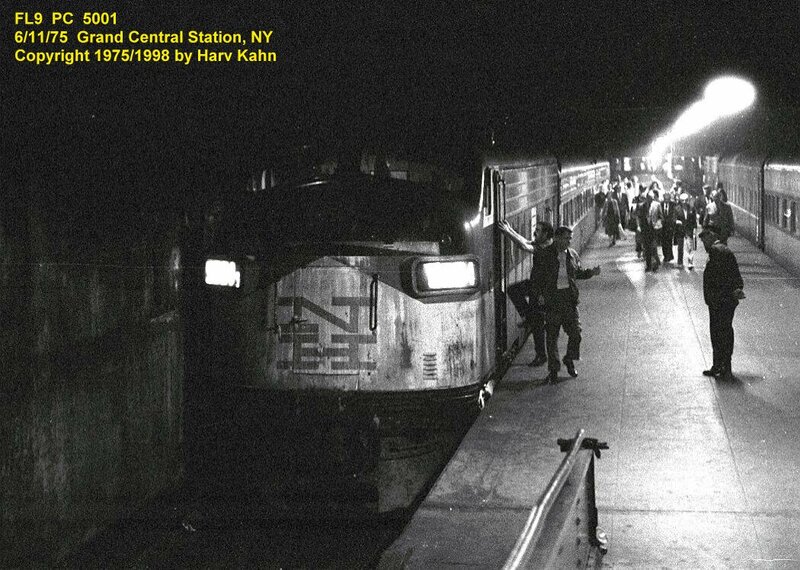 A former New Haven FL9 relettered with PC worms on its sides waits while passengers board in the concrete depths on Grand Central. Photo by Harv Kahn. 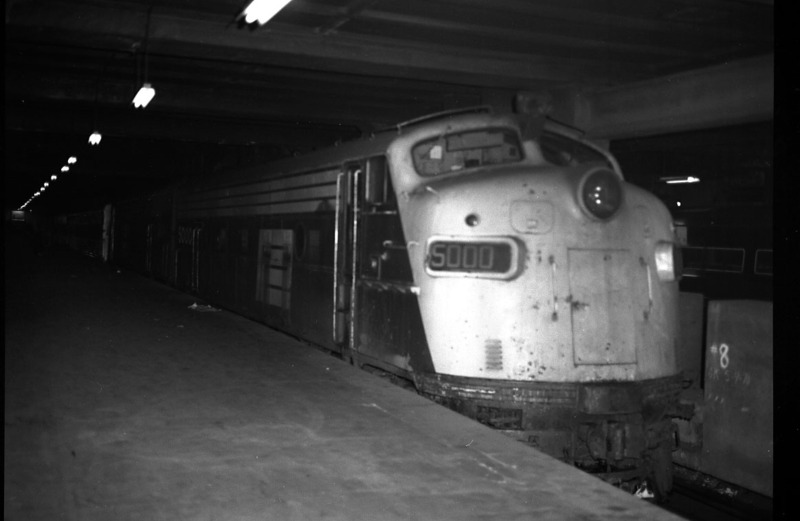 Electric S-motor 4731 is parked at Grand Central with what appears to be a train of work equipment. 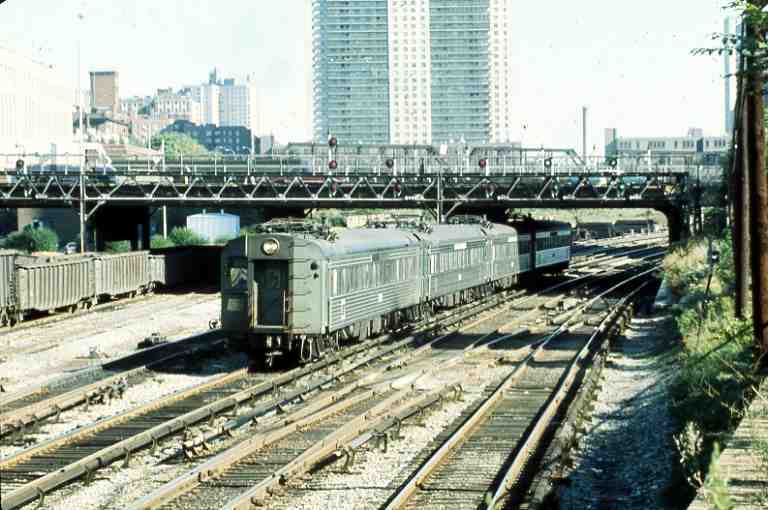 Photo by Kermit Geary, Jr.
A set of former NYC 1000-series MU cars are rolling through the station at 138 Street, just south of the junction where the Hudson and Harlem Lines divide. Photo by Gerry Landau, from the collection of Joseph Testagrose. All of the pictures at this location were taken on October 7, 1975, by Harv Kahn. 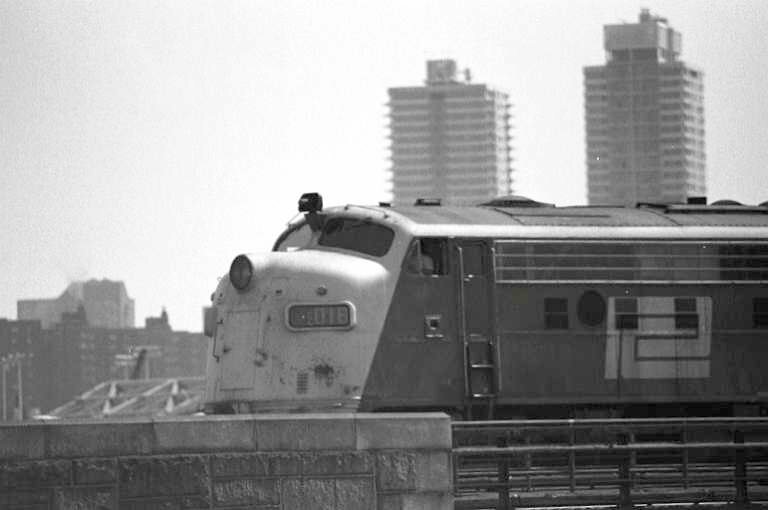 PC FL9 5018 in front of the New York skyline, ferrying passengers to their homes. 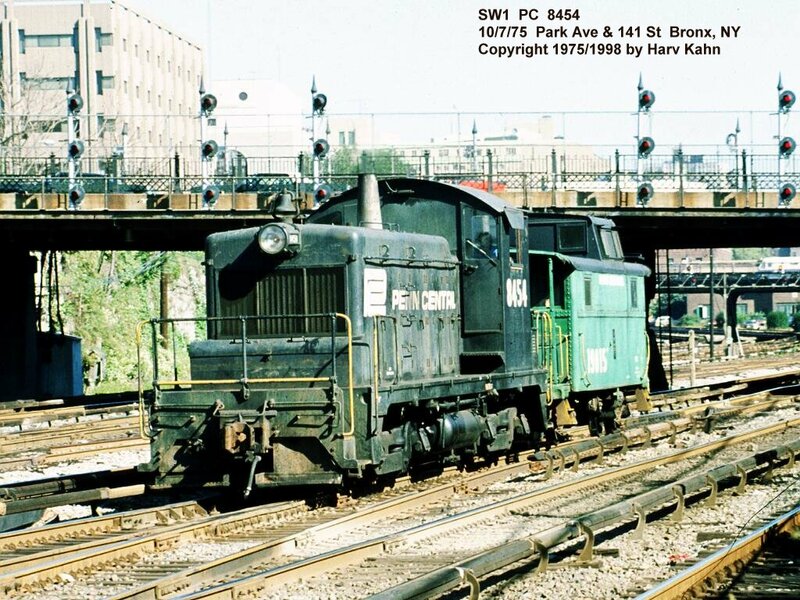 PC FL9s 5053 and 5044, running light, are about to cross the drawbridge over the Harlem River on their way toward Grand Central to pick up their train. A pair of really tattered FL9s, 5035 and 5037, lead a train under a signal bridge. 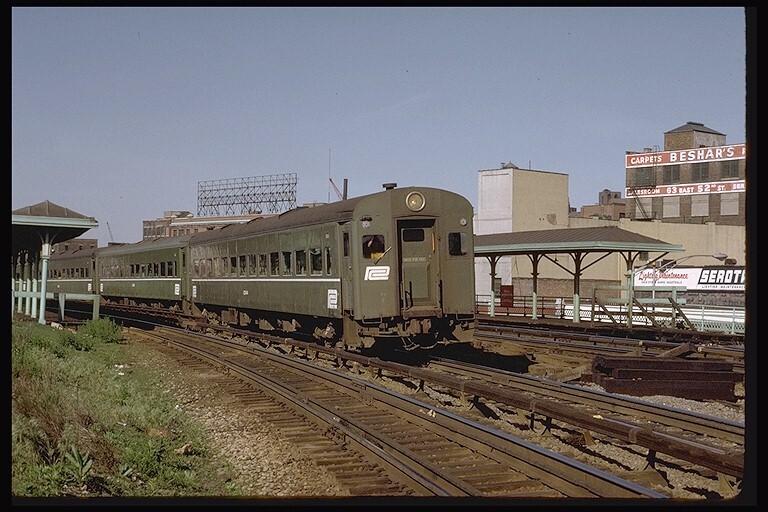 In a similar view as above is a set of four ex-New Haven "washboard" electric MU cars. FL9 5033 leads a train out of town. Badly faded FL9 5017 leads the northbound Adirondack, including a Delaware & Hudson coach. Yes, there was some occasional freight traffic through here too. In this scene, diminutive PC SW1 8454 leads a caboose hop. 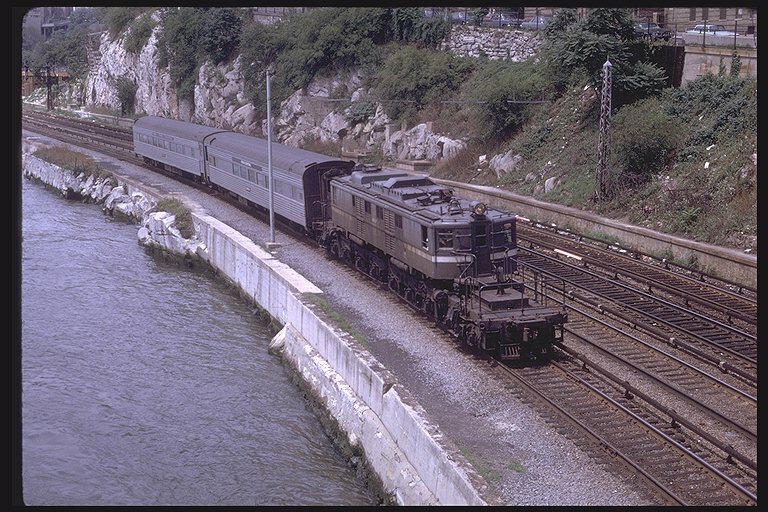 Marble Hill is a station in the Bronx, 9.6 miles north from Grand Central Terminal on the Hudson Line. 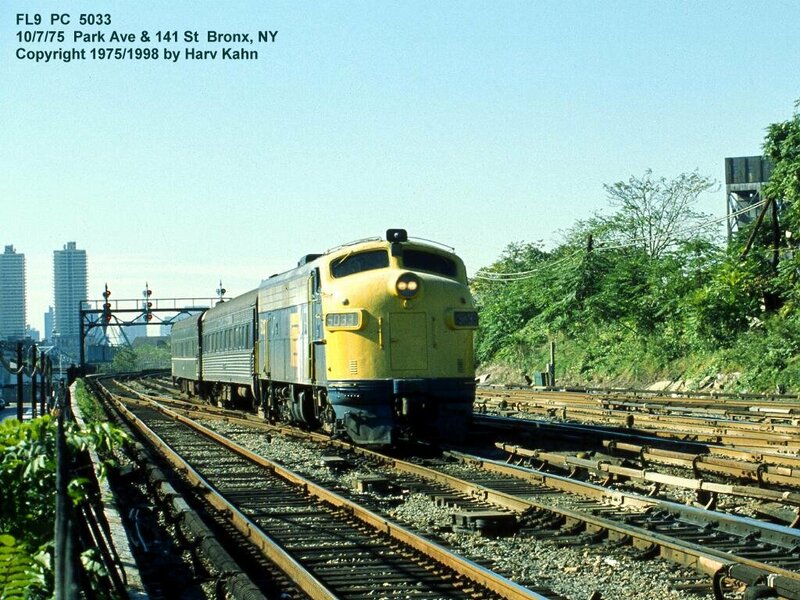 On August 2, 1970, a pair of PC 4500-series MU cars pass through Marble Hill on their way out of town. The 4500-series MU cars were later numbered in the 1000-series and were easily spotted by their large, round headlights. Photo by Joseph Testagrose. 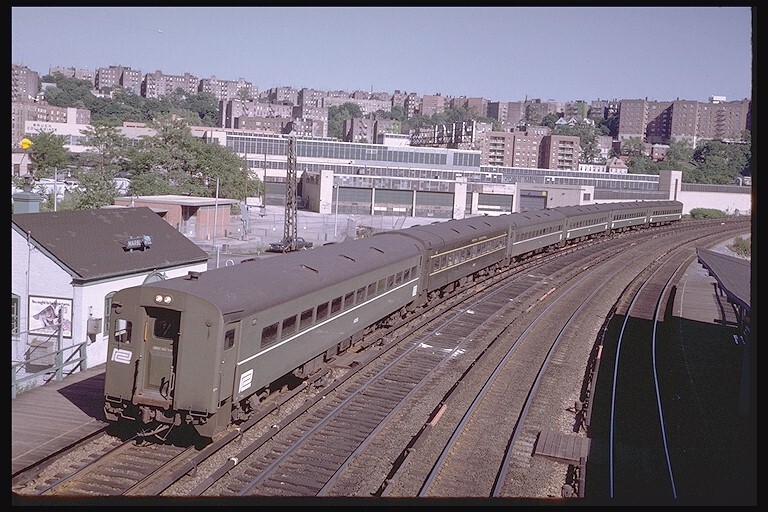 On the same day, PC 4635, a former Cleveland Union Terminal P-2b electric, brings an inbound train through Marble Hill. 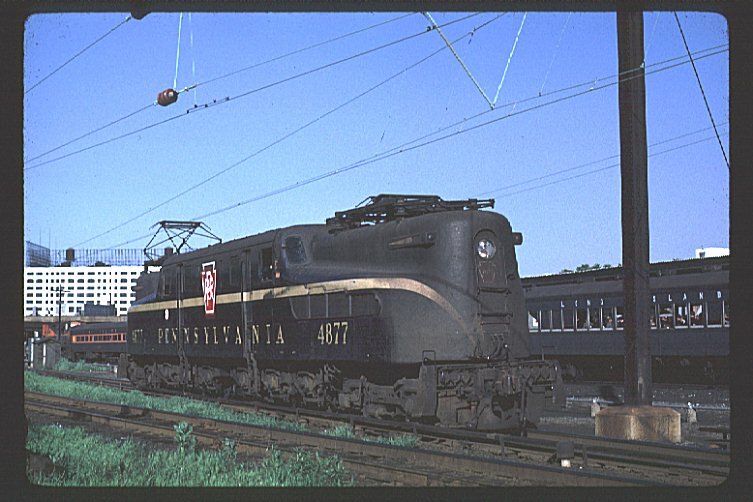 These locomotives ran on overhead catenary when built, but were later modified to run on the third rail trackage out of Grand Central. Photo by Joseph Testagrose. 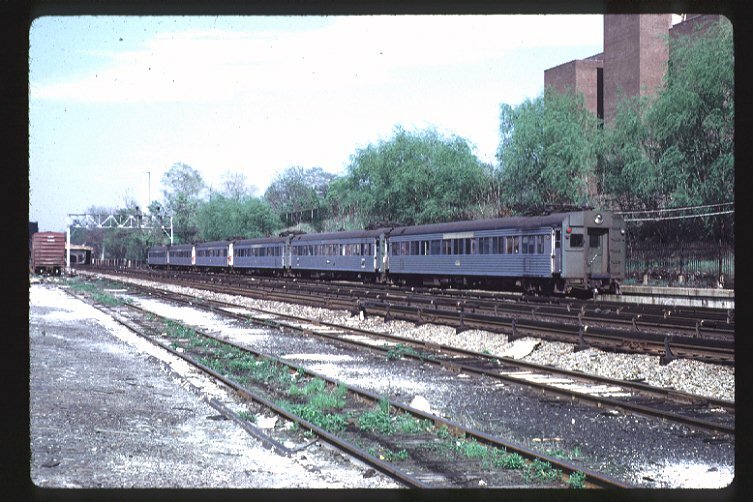 Four weeks after the previous photo was taken, a set of ex-NYC 1100-series MU cars slow to a stop at the Marble Hill station. 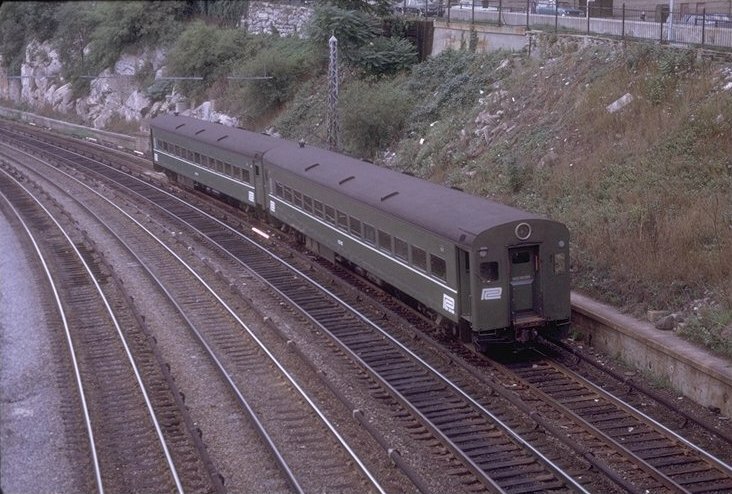 Note the second car, wearing its as-delivered paint scheme. Photo by Steve Zabel, from the collection of Joseph Testagrose. Riverdale is a station in the Bronx, 13 miles out from Grand Central Terminal, located at the north end of Riverdale Park next to the Hudson River. 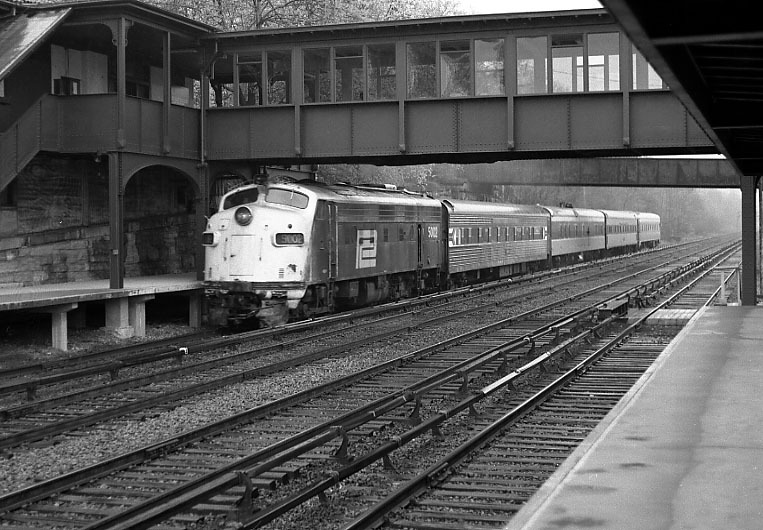 The following two pictures were taken at Riverdale station by Gary Stuebben on May 8, 1975. 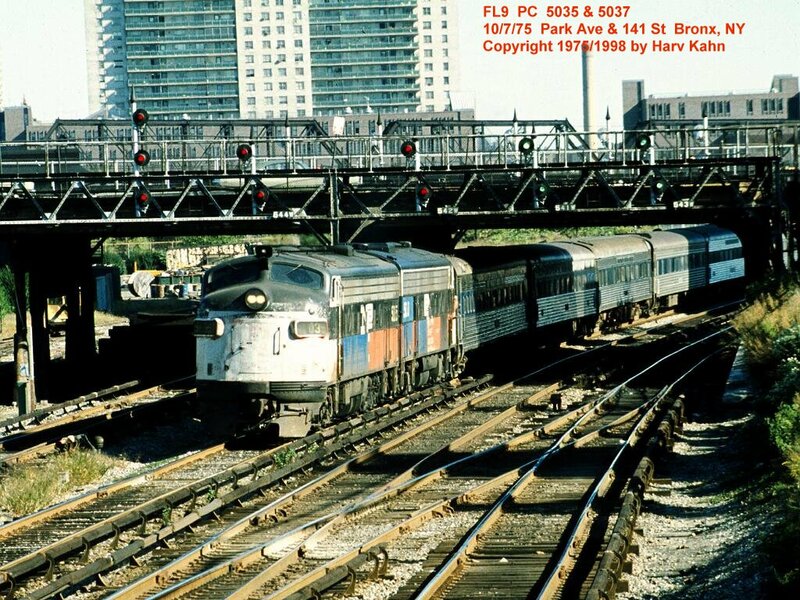 PC FL9 5001, wearing an interim paint scheme, leads an inbound train through the station. FL9 5002 brings the northbound "Laurentian" through Riverdale. The train will be handed off to the Delaware & Hudson at Rensselaer, NY. From there, the D&H will take it the rest of the way to Montreal. This is why the train is a mix of Amtrak and D&H cars. 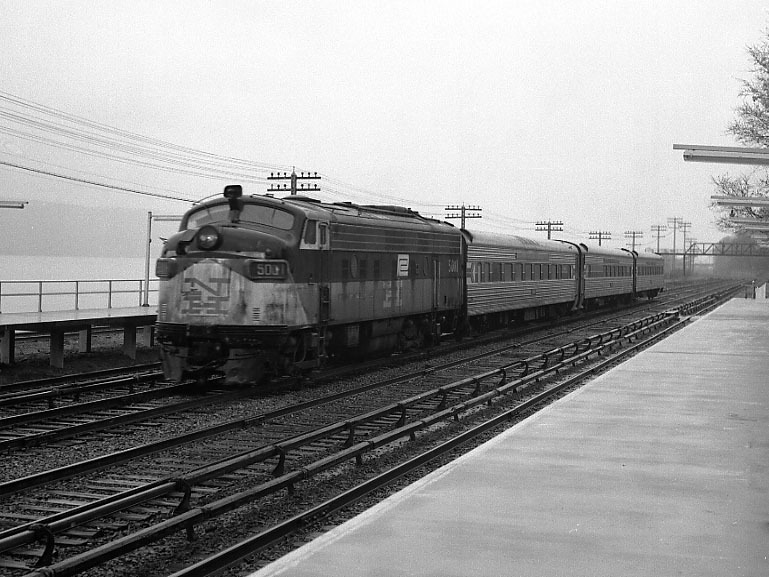 Continue the photo tour northward (timetable westward) on the Hudson Line. 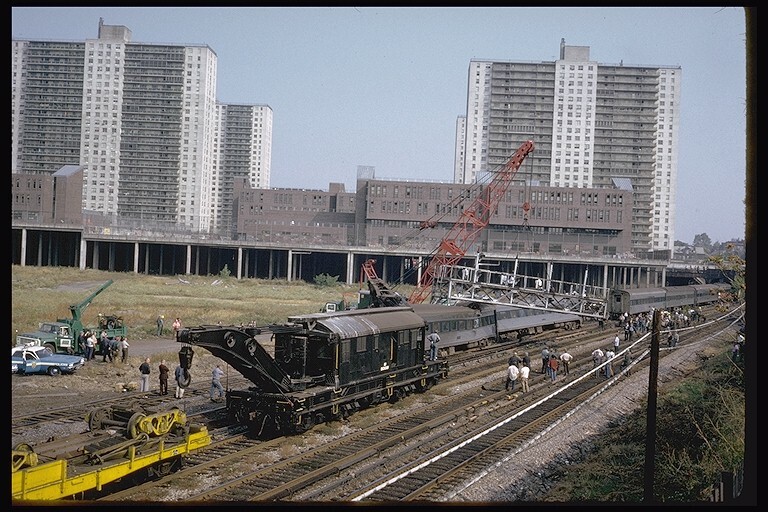 A PC wrecking crane is seen at an accident scene at 151 Street in the Bronx on October 10, 1973. Check out the crunch job the signal bridge did on the passenger car! 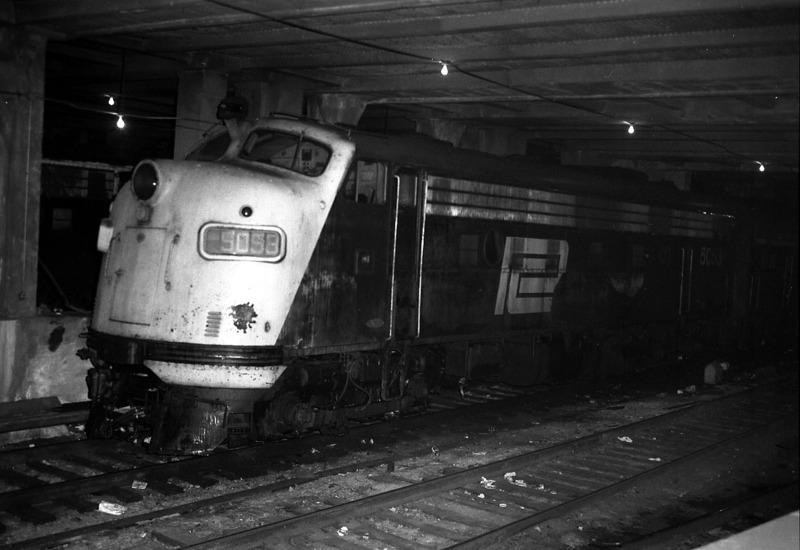 The passenger train derailed at about 7:30 AM that morning and knocked over the signal bridge, shutting down the railroad and delaying 40,000 inbound commuters for up to four hours. Service was restored to normal later that afternoon. One person aboard the damaged coach suffered minor injuries. Photo by Steve Zabel, from the collection of Joseph Testagrose. Thanks to Bob Machann for providing the background on the derailment. 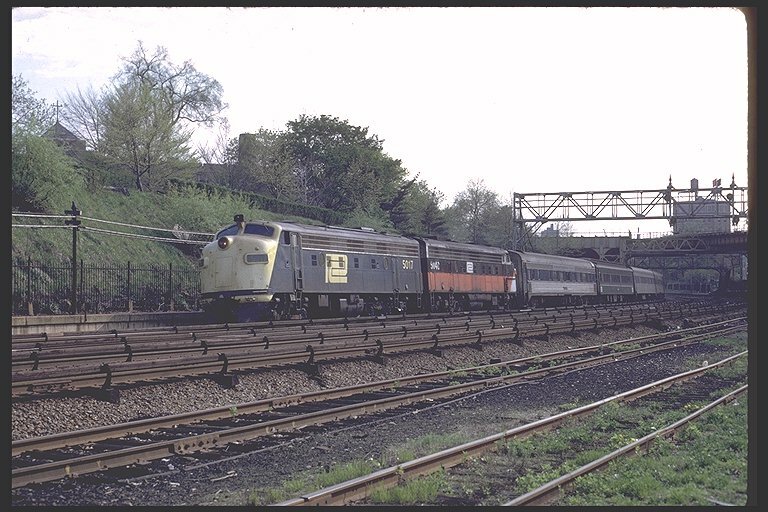 A set of ex-New Haven "washboard" MU cars are seen going through Fordham, NY, 9 miles out of Grand Central on the Harlem Line on May 6, 1972. Photo by Joseph Testagrose. On the same day, a pair of FL9s, 5017 in the MTA paint scheme and 5042 wearing its original New Haven paint, lead an outbound train around a curve through Fordham. Photo by Joseph Testagrose. A set of 1100-series MU cars make a station stop at the Botanical Garden station. The lead MU car wears its as-delivered paint scheme, while the other cars wear PC paint. Photo by Joseph Testagrose. 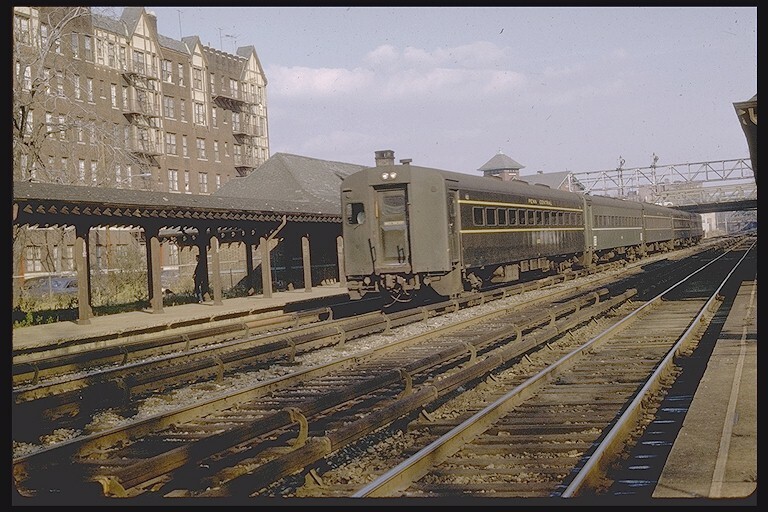 Continue the photo tour northward on the Harlem Line or eastward on the New Haven Line. Sunnyside Yard was the Pennsylvania Railroad's passenger yard in the borough of Queens, across the East River from Penn Station. The yard was 2 miles long. It was also a haven for electric locomotives, with a large electric locomotive servicing facility. It is currently still used by Amtrak. 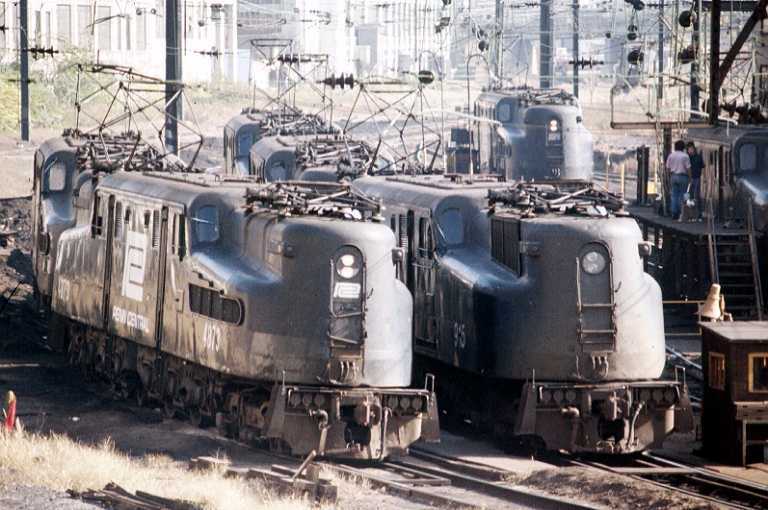 Seven GG-1s rest in the Sunnyside locomotive terminal on November 4, 1975, awaiting their next run on the Northeast Corridor. Photo by Harv Kahn. 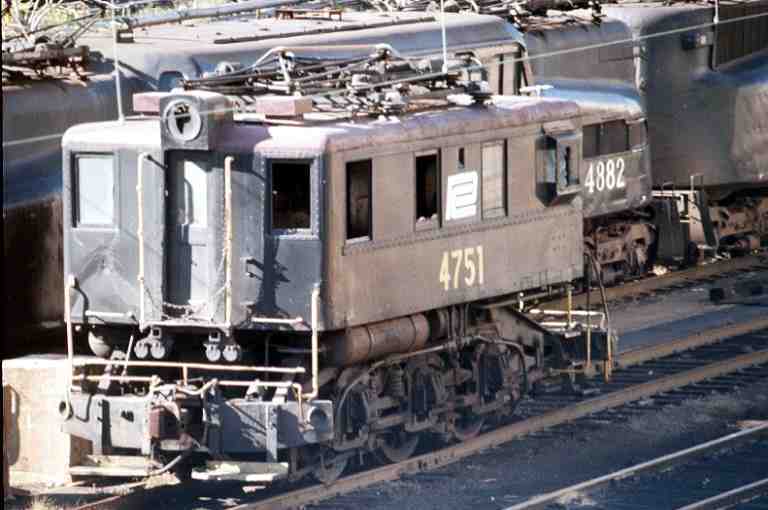 PC 4751 is a B1 electric switcher, seen here in retirement at Sunnyside on November 11, 1975. 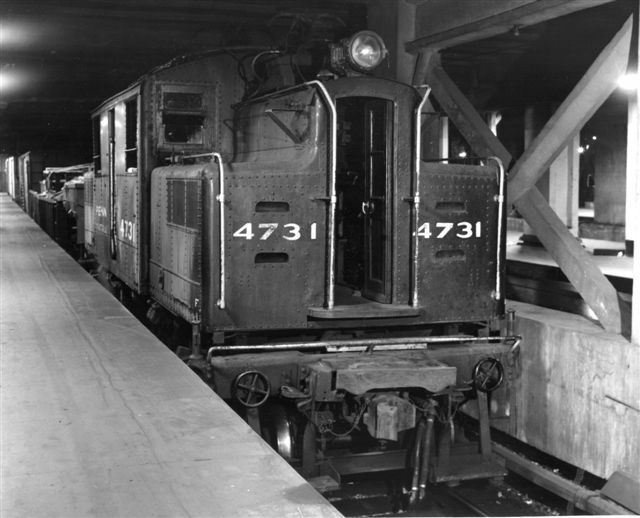 Forty-two of these unusual locomotives were built by the PRR starting in 1926. The 4751 was the last to see service, and at the time this photo was taken, its days on earth were definitely numbered. Photo by Harv Kahn. 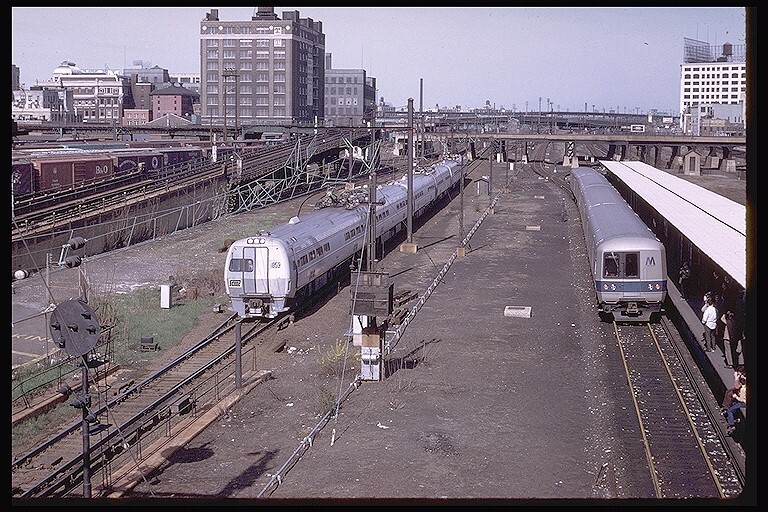 Near Hunters Point in Long Island City, east of the East River tunnels, are seen a set of PC Metroliners on the left and a set of Long Island Railroad M-1 MU cars making a station stop. Photo by Doug Grotjahn, from the collection of Joseph Testagrose. Still wearing its PRR single-stripe paint, GG1 4877 takes a break next while a Long Island commuter train passes in the background on May 26, 1969 at Hunters Point. Photographer unknown, from the collection of Joseph Testagrose. 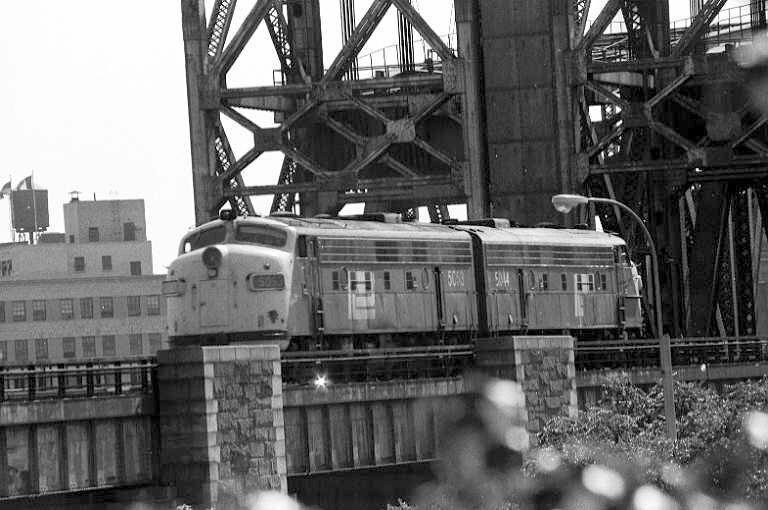 The superstructure of the main span of the Hell Gate Bridge dwarfs a passenger train, pulled by a GG1 still in old PRR single-stripe paint. Photo by Harv Kahn, date unknown. Freight on Long Island? You bet! 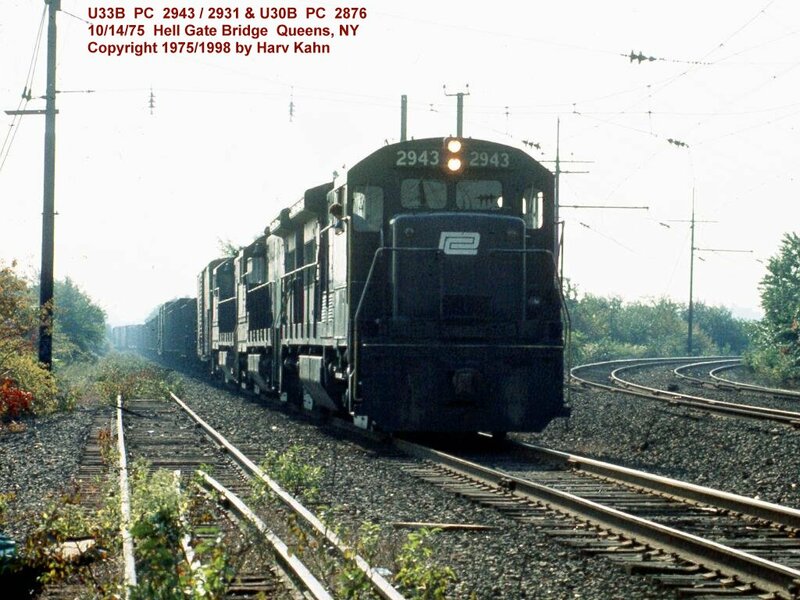 PC U33B 2943 leads a trio of U-boats north towards the Hell Gate Bridge with a train of cars from the Long Island Railroad. 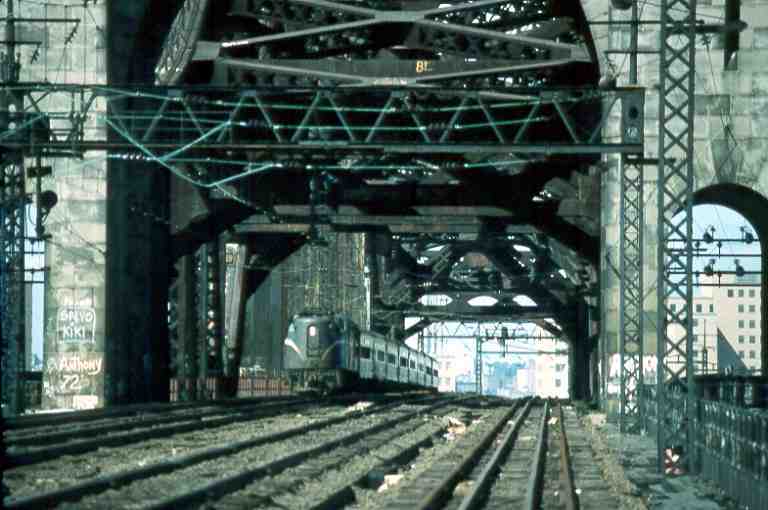 The tracks curving off to the right are the passenger main to Penn Station. Photo by Harv Kahn, October 14, 1975.